Skip links, also known as "Skip Navigation Links", are a good way to improve the accessibility of a website, providing an important shortcut for keyboard users and screen readers to browse the website, without forcing them to tab (or worse read) through the whole page before getting to the content they're interested in. A classic example of skip navigation link is "Skip to content", pointing to an anchor link placed in the same page which allow the user to skip directly to the main content. There are many ways to implement skip navigation links, the most common ones require an effort in the initial design phase: the links have actually to be placed somewhere. Unfortunately, many designers forget to include this element in their design. Some of them do not want to use it for an aesthetic reason, some others simply ignore it. For both cases there is an easy way to fix this! This method is both helpful for screen readers and keyboard users: screen readers will read the html text, while keyboard users will get a nice big skip link appearing on screen. Isn't that nice and easy? You can check it out on this demo page or even on this blog: try to click on the upper left corner of this page, then start tabbing. What do you see? In advice to use a list because this way you can always add a link to it if you think it would be useful. Personally, I think a skip to search link is quite handy. See "Multiple Skip Links" for more information. Pay attention though! Being too creative in this context might confuse the user. Be sure to stick to the common wording. This code hides the <ul> element and styles the skip links so they appear in an obvious way on screen when focusing (tabbing) on them. Before implementing this method and start to adapt the code to your needs I want to warn you about some important things you should know about skip inks. Do not use "display: none" or "visibility: hidden"
Here's a dumb way to hide content for screen readers, infact most screen readers won't read the text contained in elements set to "display: none" or "visibility: hidden". This is more than correct, because usually these two directives are used to hide parts of the page that will show up when the user accomplish some interface interaction. 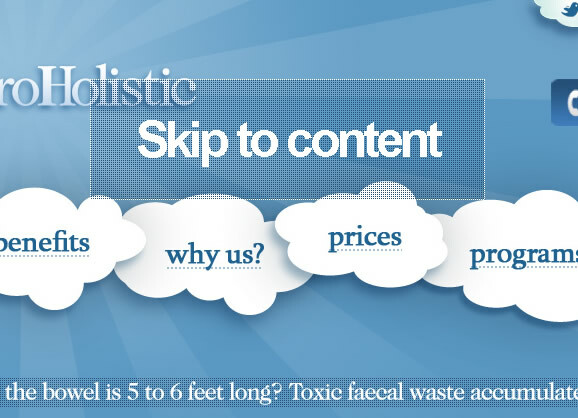 See "The search for the perfect skip link" for more information. 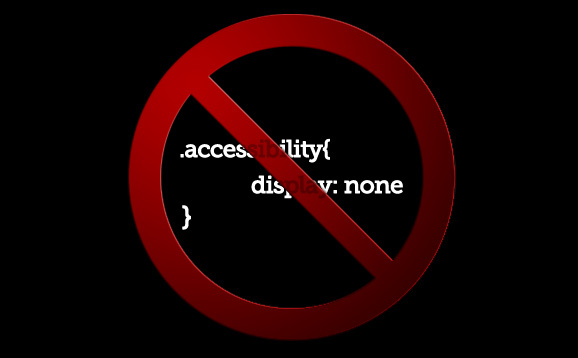 According to accessibility tests, contentless anchor elements are ignored by JAWS (which is one of the most popular screen readers in use) and several other browsers and screen readers. 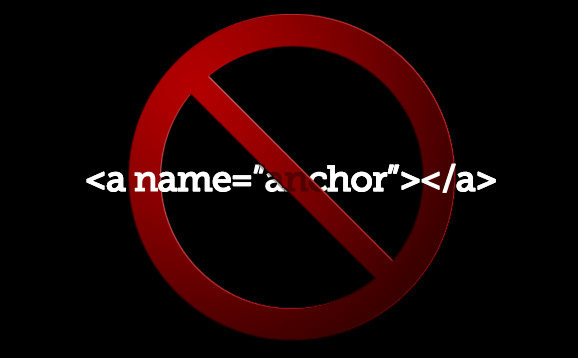 For this reason you should include some text in your content anchor. You can even put the anchor inside an heading (<h2>) or a <label> in case of the search form. This way we'll ensure screen reader users will always know without any doubt that they're browsing the same web site and they didn't jump accidentally to another one, especially if the other eventual web site would be implementing the same method placed before the logo! If something like that would happen a screen reader user would not even know he accidentally jumped on another web site. As already suggested before in the post, stick to the common wording otherwise users might get confused. You should style properly the :focus pseudoclass of all your links and forms in a way that keyboard user understand where their focus goes when they press the tab key. 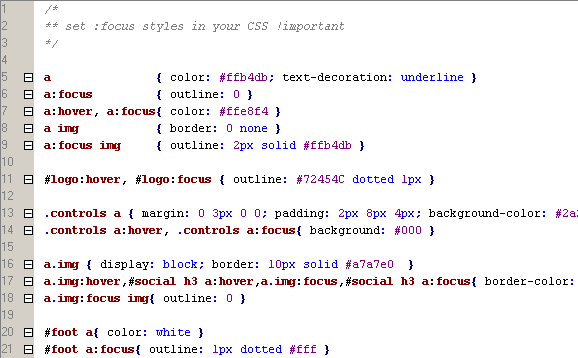 An easy and effective solution for links is to use the same styling for the :hover and :focus pseudo-classes. 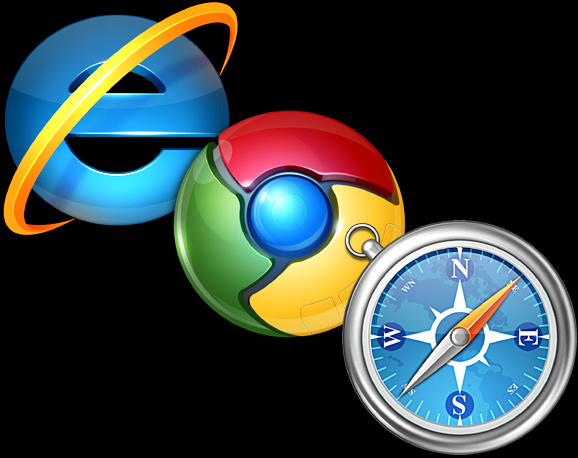 Unfortunately there are some issues that are browser related. Watch out! Have you ever assisted an old person in crossing the street? Have you ever taken someone on a wheel chair around the city? If the answer is yes, then you know how sometimes things that for us are extremely easy might be a difficult obstacle to them. How come who built this didn't think about it? 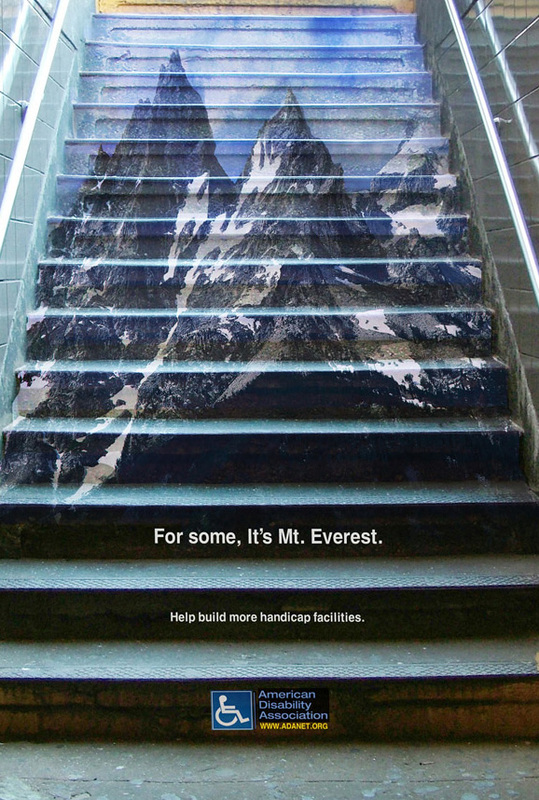 Did they forget about people with disabilities? Well if, as me, you had this thought at least once in your life and you make websites for a living, then you surely understand that is our responsibility, as designers, to not make the same error with web sites. This solution is quick, easy and doesn't involve any effort in thinking about where to place the links in the design, therefore why not implementing it? 1.) 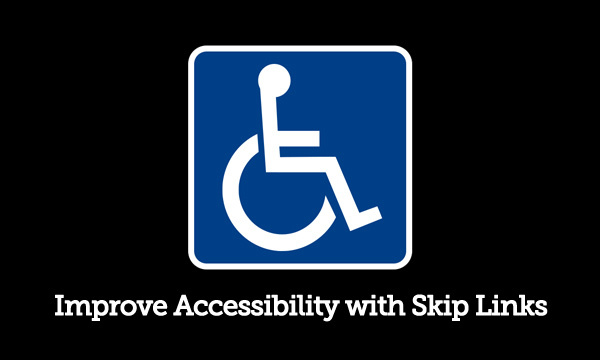 You could reuse the class accessibility for the "skip to Link"
2.) You could use the href point to ID of the main div or main content div and avoid extra markup like a name=""
“This is good advice and, like you, I really would like to see many more designers follow this and other such practices. But I would like to add one point about the wording. The annual accessibility survey by Webaim indicated a preference for text that states to where the link points, rather than the content over which it is skipping. For example; "skip to main content" is considered to be preferable to "skip navigation" because the former is less likely to be misread or misheard. 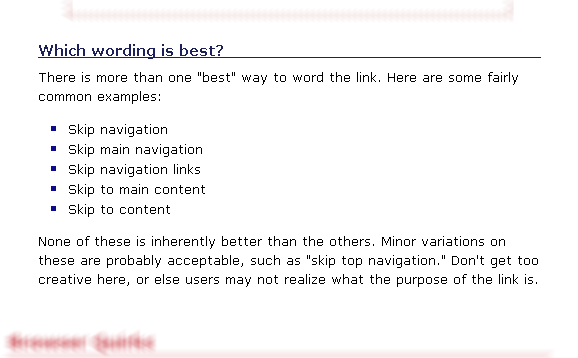 The latter might be misread or misheard as "skip to navigation". Users with whom I carry out testing all express this preference and cite this reason for it. I think 1) is just a matter of preference in CSS programming. 2) is a good suggestion, but it could be useful to have the anchor for the sake of explicity.